Now that I am back in civilization I now have a local comic store again. 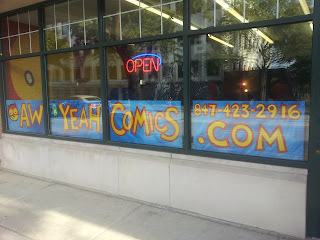 I have talked about what I feel are the virtues of local brick and mortar comic shops before. Not my local shop of course, that is Aw Yeah Comics in the Chicago area. However this blessing is also a curse. How can it be a curse you say? Well it has been so long since I had a local shop that I am out of touch. I don't know that to read, what books to pick up, what is worth my time. 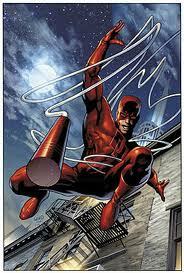 I am going to be picking up my few staples such as Daredevil. Check it out Matt is smiling! That's new. I will also be picking up the Lantern books and doing a review of the first year in the vain of Ken's Flash review series. So I put it to you dear reader - what should I be reading these days? What is your favorite book these days? Let me know what I should be picking up when I go to the shop in the comments, our Facebook page, or hit the contact us tab up at the top of the page. Where do your tastes run? I don't wanna make a list of stuff you can't stand and turn you away. Almost everything I read are indie comics so that's the sort of thing I'd be reccomending. Right now I am open to try anything. A good book is a good book if it has tights or not. So whatcha got for me?